coromandel preachings: And what exactly do you want? for the strongest king to serve. It is almost like Game of Thrones! and Christopher carries him across the river. 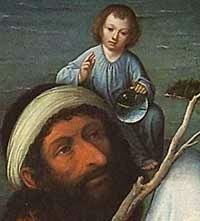 that he realises he has been carrying the Christ child. It is a very good story, and has a strong moral. rather than an account of an actual event. This does not make it untrue. that we often don't realise that Christ is there. by being in the ordinary place. The disciples have to learn this. Not unlike you and me really! nor is it some pious ritual. and God reigning in power, peace and love. St Stephen, at his martyrdom, is able to blurt this out. to the mystery of what God might be offering us. but what God might be trying to invite us into. But rather of the fact that there is a place. God has a place for us. as a relationship....How can we know the way? I am the way and the truth and the lifeI think once we grasp this we are on the way.This is what Christopher found.It is not discovery of the answer it is by entering into relationship with Jesus. uniquely draws us into the life of God. it is the promise and hope of relationship. I will know God, and God will know me. I will know and be known. It is a glimpse of glory. Where is Jesus telling me about himself? What do I tell Jesus about myself? How does this mutual revelation change us both?